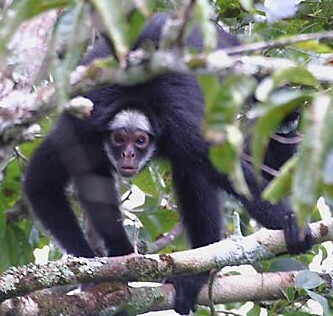 The White-whiskered Spider Monkey is currently listed as an endangered species (2003), and this particular species of monkey is also endemic to Brazil. The White-whiskered Spider Monkey was first reported in 1809 by E. Geoffroy. They are from the Cebidae (New World Monkeys) family of monkeys, belonging to the genus Ateles. Monkeys of this genus are Spider Monkeys. They are primarily black in colour, with a white patch on their forehead and sideburns hence their name of white-whiskered spider monkey. Very little research has been carried out on this particular species of Spider Monkey. E-mail to add your White-whiskered Spider Monkey related website.